Have you always wanted to learn how to drive a team of horses? Well now is your opportunity to learn from a veteran teamster. is an introduction to driving. It will feature light and draft horses as well as mules. Come learn the lost art of safe driving! 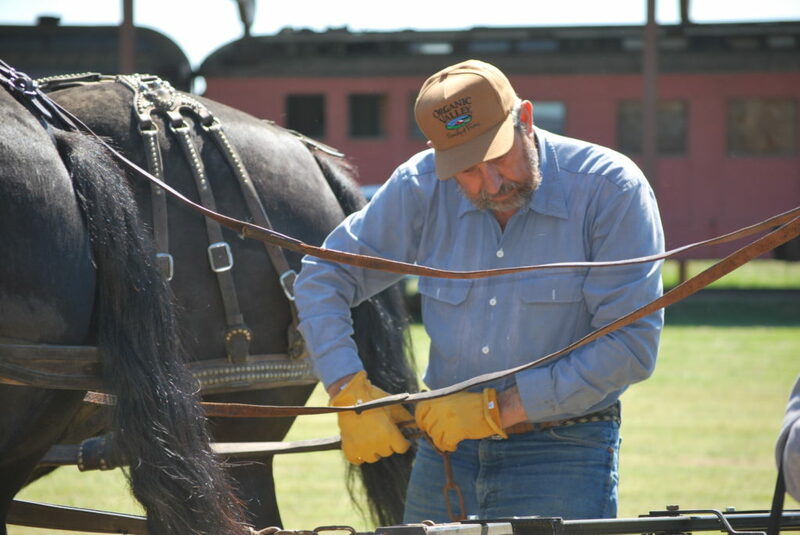 You will get experience in the proper way to harness, hitch, drive, and handle horses. It will focus on commercial driving, driving in a show ring and working farm horses. Tony T. Azevedo has been commercially driving horses for 34 years and has spent over 20 years instructing individuals in commercial driving. He has one of the largest carriage and wagon collections in California. Please send registration fee to reserve your spot in the class. This is a novice course, no experience necessary. Where is Stevinson? Two hours south of Sacramento, 45 min. north of Los Banos, 30 minutes East of Merced. What should I wear? Sunscreen, Comfortable rugged clothing. (Jeans etc.) Closed-toe shoes. No flip-flops, sandals or open toe-shoes. Can I bring my pet? Please leave pets at home for safety reasons. Can I bring my children? Please leave children at home for safety reasons. No one under 18 will be admitted. Do I need experience? This is an entry-level course. No experience necessary. How dangerous is this course? There is a certain amount of risk when working with live animals. You will be required to sign a waiver and your participation is at your own risk. What will get out of this clinic? A better understanding of harnessing, driving and hitching a horse. The safe and proper way to handle horses. A unique experience that will last a lifetime. Do I need to bring anything? A positive attitude, sunscreen and proper attire, (see above) and a willingness to learn.